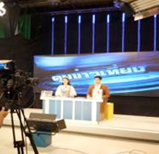 Delta installed its 67” Video wall and display controller for a broadcast Project in Guandong, China enabling the Radio and Monitoring Center to preview the programs, VTRs, Cameras, graphics and other video. The Delta DLP® displays have pioneered the technology ensuring redundancy for 24x7 operations. Delta offers the newest and state-of-the-art display solution for these critical broadcast and control center for Monitoring purpose.